P2 Volume Gloss 021 Young Miss | Light Your Nails! I am back with another nail polish swatch from Austrian brand P2. 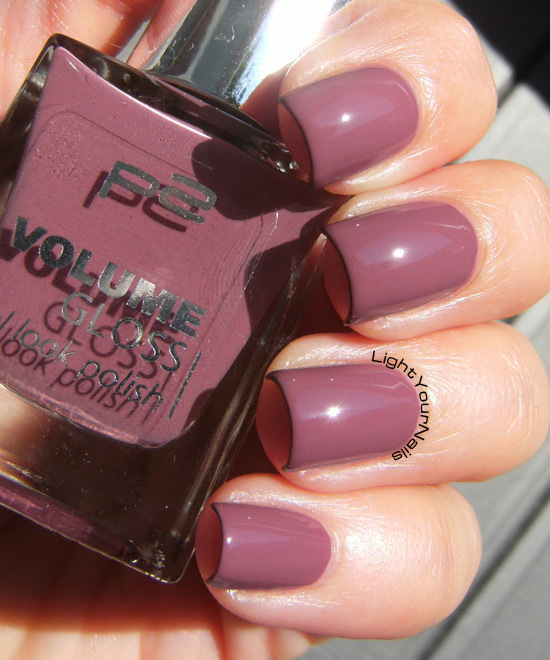 P2 has got several collection and today’s pick comes from the Volume Gloss line and it’s called Young Miss. P2 Young Miss is a lovely mauve creme with a fantastic formula. It’s a one coater although you see two in my photos. No top coat! It’s so glossy I couldn’t avoid some reflections on the nails! That’s an incredible shine. Oggi vi mostro le foto di un altro smalto P2, brand austriaco approdato nei punti vendita OVS e Upim. P2 ha diverse linee di smalti, quello di oggi fa parte della Volume Gloss e si chiama Young Miss. P2 Young Miss è una bellissima lacca color malva con una formulazione perfetta. Coprente in una passata, anche se in foto ne vedete due. Senza top coat! E’ talmente lucido anche da solo che non sono riuscita a evitare tutti i riflessi sulle unghie! No secret I love shades like this one. I think they are super classy, elegant, feminine, and perfect for every occasion. Mauve cremes are my go-to shades for anything work-related, from a job interview to any kind of event. I also want to add the P2 Volume Gloss brush is brilliant. When I painted my nails with Young Miss I wondered why I didn’t notice with my previous swatch of P2 Can’t Get Enough. Easily said, I checked that bottle and the brush in the Color Victim line is not the same as the one in the Volume Gloss line. This one is amazing. It’s a thin rounded brush that fits smaller nails but depending on how much pressure you use on it it opens up to a large brush! I hope it’s clear enough from my photos? Non è un segreto che io vada matta per i colori come questo. Penso che siano eleganti, femminili e adatti a tutte le occasioni. Le lacche color malva sono il mio passe-par-tout per qualsiasi cosa legata al lavoro, dai colloqui alle fiere. Voglio anche spendere due parole sul pennello della linea P2 Volume Gloss. Quando ho steso Young Miss mi sono chiesta come non mi fossi accorta del pennello quando ho usato P2 Can’t Get Enough. Presto detto, ho controllato la boccetta e il pennello della linea Color Victim non è lo stesso della Volume Gloss! Questo è fantastico! E’ un pennello a lingua di gatto dalla punta fine, perfetto per le unghie strette e piccole, ma facendo pressione su di esso si allarga coprendo anche le unghie più grandi! Spero che si capisca dalle foto? I really find this brush so brilliant because it’s the perfect size for both smaller and larger nails, all at once! And I sure love P2 Young Miss as I’ve said before. Plus one coaters are always a big thumb up for me! Hope you enjoyed today’s swatch. Let me know if you like this kind of colours and if you had the chance to try any P2 nail polish! Penso che sia veramente una forma intelligente perchè si adatta perfettamente alla larghezza di tutte le unghie! Come dicevo prima amo questo smalto in particolare, e poi quelli coprenti in una passata hanno una marcia in più per quanto mi riguarda. Spero che anche a voi sia piaciuto lo smalto di oggi. Fatemi sapere cosa ne pensate di questo tipo di colori e se avete trovato gli smalti P2 dalle vostre parti! I tried mainly sandy P2 nail polishes and 2 of the Summer Attack collection - they both were stainers, sandy P2 weren't and they had OPI-like finish. Ouch, that's bummer! I have never experienced staining with them, yet! Even not with the reds! Mi piace molto il dettaglio del pennello, sarebbe la volta buona che riesco a usare senza problemi un pennello a lingua di gatto :D il colore è decisamente versatile! Li preferisci piatti? A me piacciono a lingua di gatto, il problema è che molti sono più larghi dei miei mignoli! Non avere alcun ovs vicino è una vera rottura, infatti non posseggo ancora alcun P2. Sui pennelli noi ci intendiamo quindi mi fido del tuo giudizio in merito. Anche io credo che questi colori siano molto eleganti. They are expanding quite quickly so I am pretty sure you'll get them soon! bellissimo per la lucentezza, ma a me il malva non piace per le unghie, infatti credo di averne solo un paio di smalti così! Oh how I love colours like this one! It's stunning! I can see why you love shades like this so much. It's very universal and such a creme cake. I could totally see myself wearing this shade for the office. 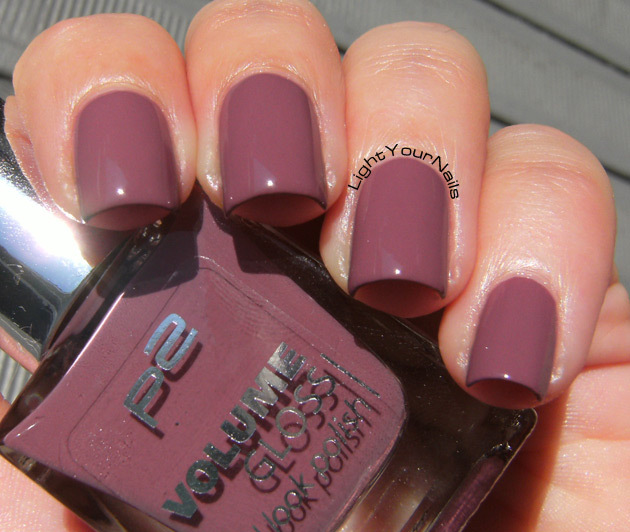 This mauve has just enough of something that keeps it from being grandma-ish, very nice! I have never heard of this brand but the brush looks awesome and that shade is AMAZING!! Thank you! I think I've heard it's coming to the US soon so you will sure have the chance to see it! This is a really nice color! It's not something that I would wear on its own, but I could definitely see it paired with a gold glitter. That would make a great combo indeed! Shades like these always make their way into my stash, lol! I know, right? I have a ton, too! Lovely shade. I like rounded brush too, something like Rimmel London Pro colection. They make application even and easy. Rich and dreamy! This is exactly the type of colour I love! It's a perfect base for a nail art indeed!